What is the best way to get my son/daughter started in jump rope? The best way for a new jumper to get started is to enroll in one of our many instructional class sessions. Our instructional classes offer jumpers the ability to learn and enjoy the benefits of jump rope in a supportive, non-competitive and fun environment. Is my son/daughter ready to join the Bouncing Bulldogs Jump Rope Team? The Bouncing Bulldogs Jump Rope Team is designed for jumpers with an expressed interest and commitment to developing as a skilled jumper. The program is challenging and jumpers should first explore the instructional classes to discover if being a part of a jump rope program is something s/he truly desires. How many classes are included in a session? Each instructional jump rope session consists of multiple classes. In some sessions there may be up to 5 classes. Classes take place on Monday, Thursday and Saturday in both the fall and spring semesters. How are jumpers placed into groups? How many jumpers are in each class? At the beginning of the first class, jumpers are evaluated by our professional staff and placed into both skill and age appropriate groups. Based on the groups that jumpers are placed in, our professional staff of instructors typically work with students in an average jumper-to-instructor ratio of 5:1 in one of the three gymnasiums inside our facility. Is there a policy on missing classes and make-ups? The Bouncing Bulldogs policy is that absences and make-ups will be evaluated and handled on a case-by-case basis. What are the hours for the Holiday, Spring Break and Summer Camps? Each Bouncing Bulldogs camp session starts at 8:00 a.m. and ends at 12:00 p.m.
Do all campers get to perform in the end of camp performance? Yes, all jumpers will perform on the last day of camp for their families, jump rope enthusiasts and supporters. They will be led by the camp staff in routines that have been developed and practiced throughout the duration of camp. Are parents and/or visitors allowed to observe camp? Yes, visitors are welcome to observe camp as our program has an open door policy for parents and family members. However, we kindly ask that parents and visitors sit in the designated chairs in our lobby area, which has one-way mirrors, for the safety of our campers as well as to not distract the camper you are observing. What types of groups, organizations, events, etc. does the program perform for? The Bouncing Bulldogs Demonstration Team performs for a wide range of audiences. A sample of the audiences we have performed for can be found by visiting our past performances page and includes, but is not limited to, the following: school assemblies, health conferences, community-based, corporate and sporting events. What are the technical and logistical requirements needed for your performance? The Bouncing Bulldogs Demonstration Team prefers to perform on a clean stage or gymnasium floor. A wooden floor surface is preferred for the safety and optimal performance of our jumpers, but other surfaces can be accommodated if necessary. If available, we request a sound system equipped with microphone, cd player and a digital music player input port. The Bouncing Bulldogs Demonstration Team’s normal performance lasts between 30 and 45 minutes. We provide both an entertaining and interactive experience for the audience. Depending on the audience and specific engagement, the performance type could vary. How much are tickets to the Annual NC Rope Skipping Workshop Jump Rope Spectacular and when can they be purchased? Tickets are $20 and $15 (in advance). There is no guarantee that tickets will be available if purchased at the door on the day of the event. Information on purchasing tickets and an event program will be available two weeks before the workshop. 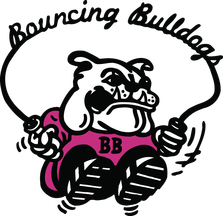 Do the Bouncing Bulldogs conduct outreach programs and/or workshops? Yes, the Bouncing Bulldogs program offers workshops as well as educational enrichment programs for community groups, schools and other organizations. The program views these powerful partnerships as an important part of our mission to promote jump rope as not only fun and fitness but also as a tool for collaboration and engagement. For more information on these outreach programs, please select “Workshops” from the drop down menu on our contact us page.